It's been a quiet week in the sewing room. I did however take some time to play with my new Neocolor Crayons and also pulled out my Derwent Inktense Pencils. I drew up a quick flower and using Clear Aloe Vera gel as a medium. 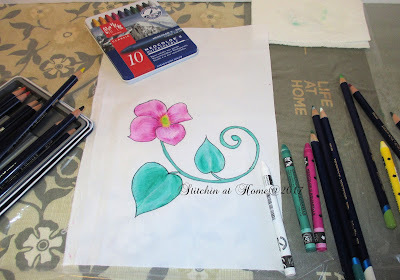 I painted the flower, I just let it flow and had fun. 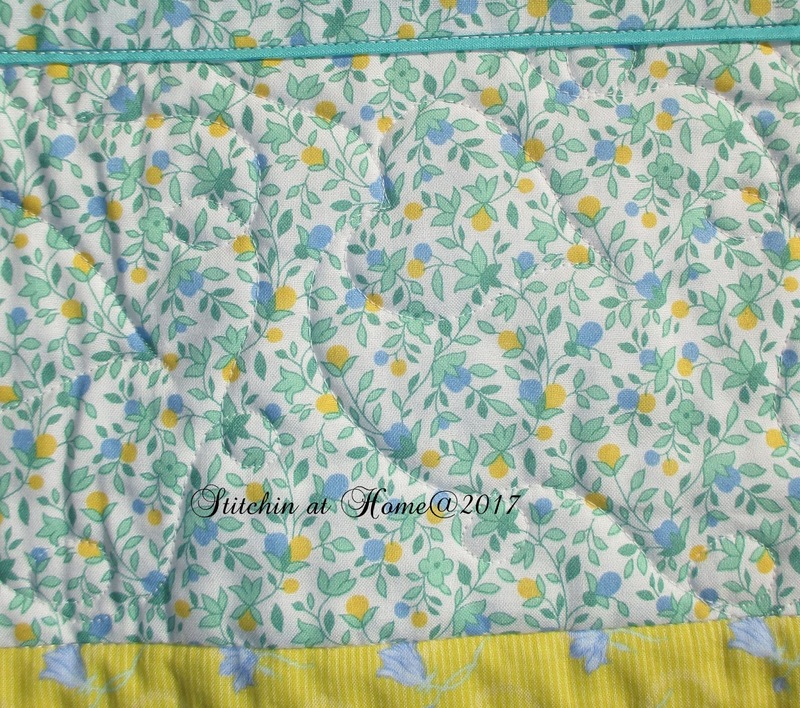 The Quilt Rat has a great tutorial on using Aloe Vera Gel. No idea what I'm doing with the flower yet. 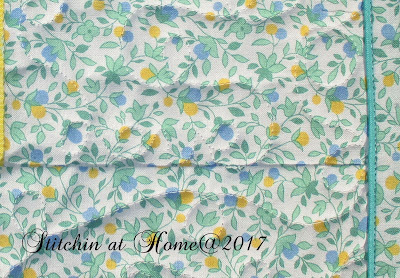 All this playing is before I use either of these techniques on my Guild Challenge for our upcoming Quilt Show June 9 & 10, 2017. I wanted to highlight some areas of the applique. I will do a post with more photos later, when the project is finished. 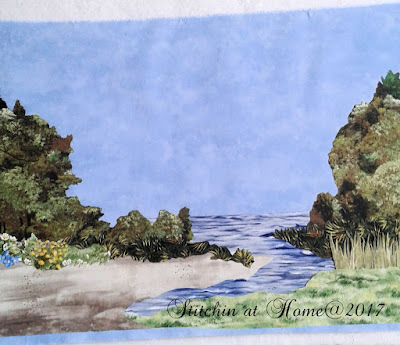 My guild has put together kits of donated fabric for quilt tops, I took this one home to work on. Some are panels as this one was, some have strips or bits and pieces of fabric. Tweety was a panel and I bordered it with two other fabrics a lovely green print and a nice yellow floral print. I used a piece of backing from my stash and quilted this one together quickly. I added a couple hearts and stitched in the word love. I used some straight lines on the inner borders and loops in the outer border keeping the quilt soft. 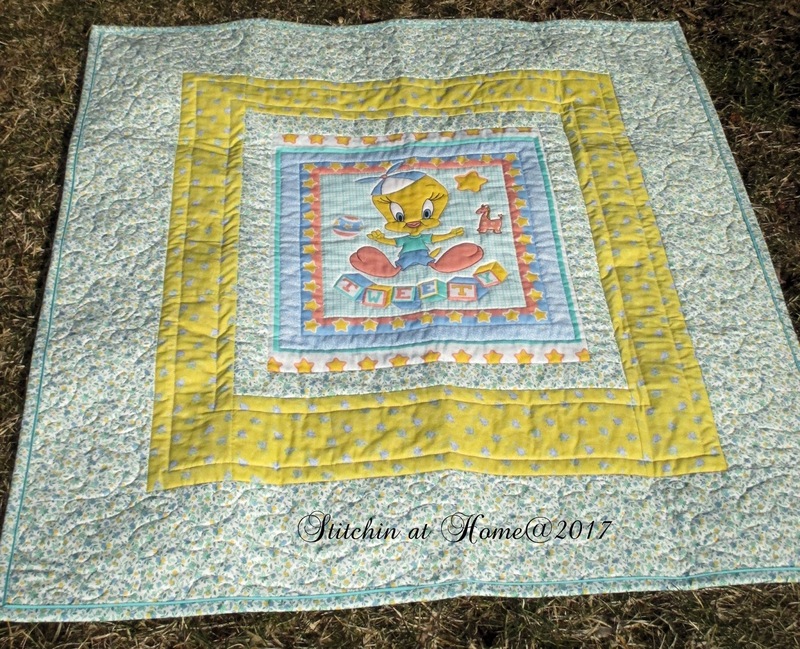 Added a flange border, this quilt will be donated to Ronald MacDonald House through my guild. That wraps up my quilting week in a nutshell. How was your week? What a sweet baby quilt to finish up and donate. I hope it brings joy and comfort to whomever receives it. I admire all you artists so much - all I can draw are stick figures! Your flower is lovely and I'm looking forward to seeing more. 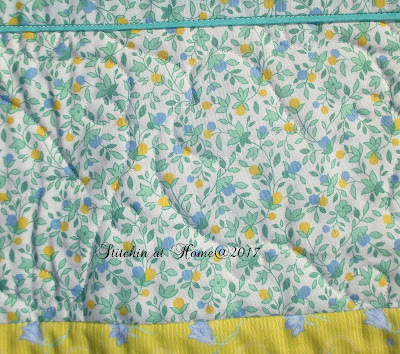 The baby quilt is so sweet and I'm sure it will bring some comfort to the family who receives it. Thanks for sharing it on MCM! Like I said on Instagram, this is incredibly beautiful! Love what is coming together for your guild challenge and wonderful quilt for Ronald McDonald House. You know how I love quilting in words, so 'love' and the hearts with it are perfect. Cindy, that flower is beautiful. I will have to pass that tutorial on to my daughter. That looks like something that would be right up her ally. I'm always blown away by the details in your applique.